Our newsletter, Harmonic Timing of Soybeans, delivers the most insightful cycle and seasonal analysis for soybeans you can buy…period! The eight to ten page monthly newsletters focus on intermediate-term cycles and patterns in soybeans. Our Cycle Turn Windows are projected weeks and months in advance so you can plan your trading or marketing strategy. There is an extensive use of charts to track and project the unfolding cycles and patterns. The monthly newsletter includes Special Reports and access to occasional videos before they are released to the public. As part of the soybean newsletter, you’ll receive up-to-date market analysis and commentary each Wednesday and Saturday. This commentary includes discussions about our proprietary cycles, our unique Pattern of the Four Seasons, and momentum analysis. Our newsletter, Harmonic Timing of Corn, delivers the most insightful cycle and seasonal analysis for corn you can buy…period! The eight to ten page monthly newsletters focus on intermediate-term cycles and patterns in corn. Our Cycle Turn Windows are projected weeks and months in advance so you can plan your trading or marketing strategy. There is an extensive use of charts to track and project the unfolding cycles and patterns. The monthly newsletter includes Special Reports and access to occasional videos before they are released to the public. As part of the corn newsletter, you’ll receive up-to-date market analysis and commentary each Wednesday and Saturday. This commentary includes discussions about our proprietary cycles, our unique Pattern of the Four Seasons, and momentum analysis. Our newsletter, Harmonic Timing of Stocks, delivers insightful cyclical, economic, and technical analysis of the S&P 500. The eight to ten page monthly newsletters focus on long-term and intermediate-term cycles and patterns in the S&P 500. Our long-term cycle analysis can be quite useful. At a small meeting in Kansas City the weekend of March 18 & 19, 2000, Ernie is on video tape advising participants that a three year bear market was poised to begin and that they should go home and sell stocks. While not quite as timely, the Harmonic Timing of Stocks newsletter in May 2008 advised subscribers to tighten up protective stops and to expect the bear market to continue. Our cycle Turn Windows are projected weeks and months in advance so you can plan your trading or marketing strategy. There is an extensive use of charts to track and project the unfolding cycles and patterns. The monthly newsletter includes Special Reports. As part of the stocks newsletter, you’ll receive up-to-date market analysis and commentary each Tuesday, Thursday, and Sunday. These Updates are taken from our Trading Report and include discussions about our proprietary cycles, the unfolding pattern, and momentum analysis. Our Trading Report is a unique, one of a kind TRADING Service! You will receive our proprietary cyclical analysis of soybeans, corn, gold, S&P 500, and the 30-Year Treasury Bond. The Trading Report is published 12 weeks per quarter. Typically each Report is 8 to 10 pages in length. Tuesday’s Report has commentary along with extensive charts showing cycle and technical analysis of gold and bonds. Thursday’s Report has commentary along with extensive charts showing cycle and technical analysis of the S&P 500. Sunday’s Report has commentary along with extensive charts showing cycle and technical analysis of soybeans and corn.Each Trading Report contains price targets and support and resistance levels based on Ancient Geometry and Ratio Price Projections. The reports outline both longer-term and shorter-term strategies. When a trade is to be taken, specific entry triggers are outlined. Each trade has a specific initial protective stop. Each trade has an exit strategy. 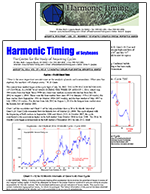 Harmonic Timing of Soybeans and Harmonic Timing of Corn newsletters. Each newsletter costs $81 every three months if purchased separately. Harmonic Timing Trading Report. The regular cost of this Report is $67 per month or $201 every three months. Bundled price of $261 every three months. You save 28%. 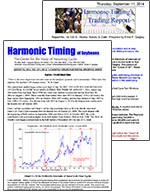 Harmonic Timing of Soybeans or Harmonic Timing of Corn newsletter. This newsletter costs $81 every three months if purchased separately. Bundled price of $201 every three months. You save 29%. 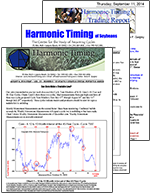 Harmonic Timing of Soybeans and Harmonic Timing of Corn newsletters. Each newsletter costs $81 every three months if purchased separately or $162 for the two newsletters. Bundled price of $147 every three months. You save 10%. 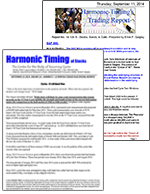 Harmonic Timng of Stocks newsletter. This newsletter costs $81 every three months if purchased separately. Harmonic Timing Trading Report. The regular cost of this service is $201 every three months. Bundled price of $201 every three months. You save $29%.. Since 1932 the One-Sixth Interval of the 84-Year Cycle has traced out a total of six highs and lows. This 10-Page Special Report shows and analyzes these measurements. The Special Research Report shows and analyzes the last time soybeans declined from a 30-Year Cycle high (1983 & 2013) to an 84-Year Cycle Low (1986 & 2016). How to Pyramid Into a Position Research ReportA 9 page Research Report-How to Pyramid into a Meaningful Position During a Bull Market using Corn as an Example. For Only $72 – Regular price $107. You’ll Save 33%. A 16 page Research Report-How Professional Traders Stalk Explosive Multi-Month Bull Market Rallies. A 23 page Pattern of the Four Seasons Research Report- The Seasonal Pattern of Annual Highs & Lows in Soybeans & Corn.